Almost 80% of the world's diamonds are sold in New York, in Diamond District. A year-long study that was done several years ago found that jewelry, diamonds and gold were three of New York State’s top four exports. The name diamond is derived from the ancient Greek αδάμας (adámas) - “unbreakable” and have been treasured as gemstones since their use as religious icons in ancient India. Most natural diamonds are formed at high temperature and pressure at depths of 87 to 120 miles in the Earth's mantle. The diamond is uniquely resistant to damage by heat or scratching, and can be cut or polished only by another diamond. The mid-nineteenth century discovery of diamonds in South Africa sparked the world's biggest diamond rush. There are a limited number of commercially viable diamond mines currently operating in the world. There is only one non-commercial diamond mine - The Crater of Diamonds, an Arkansas State Park that is open to the public. Diamonds were very popular in the middle ages. Many large and famous stones such as the Koh-I-Noor and the Blue Hope were found in India at that time. You can read about Blue Hoope - the Moonstone in one of my posts. 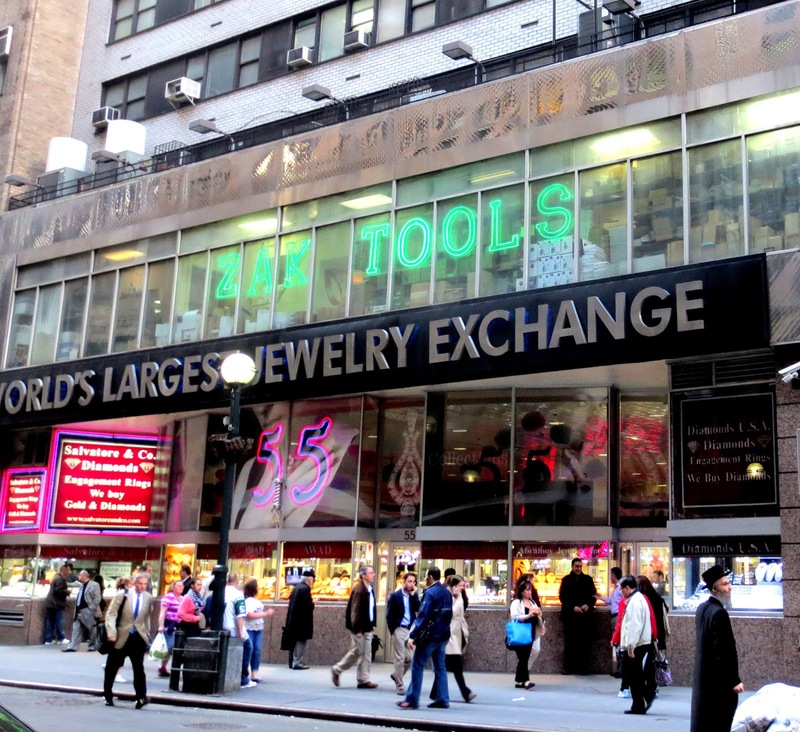 Until the mid-1940s the jewelry trade was headquartered downtown, at Maiden Lane. In 1923 Fenimore C. Goode, a broker, promoted construction of a new building at 20 West 47th Street specifically to tempt the Maiden Lane firms to move. 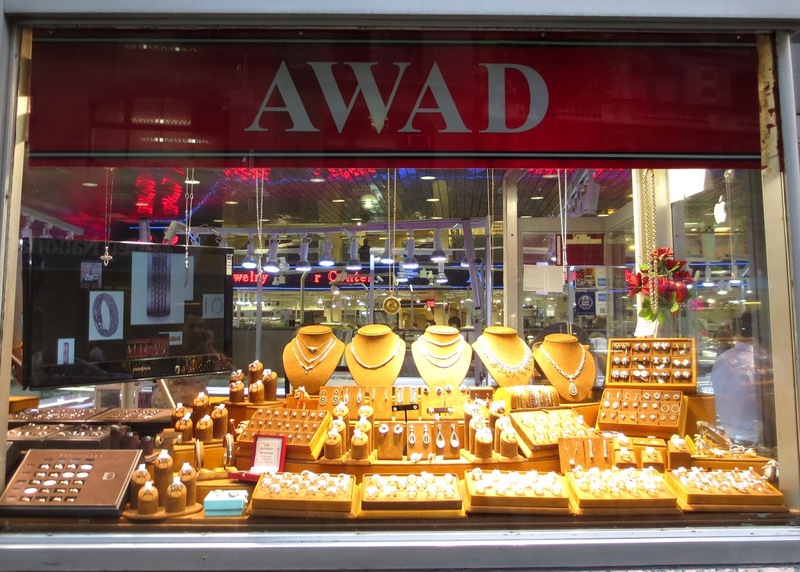 There are more than 4,000 independent businesses in the Diamond District now, and nearly all of them are related to diamonds or fine jewelry. 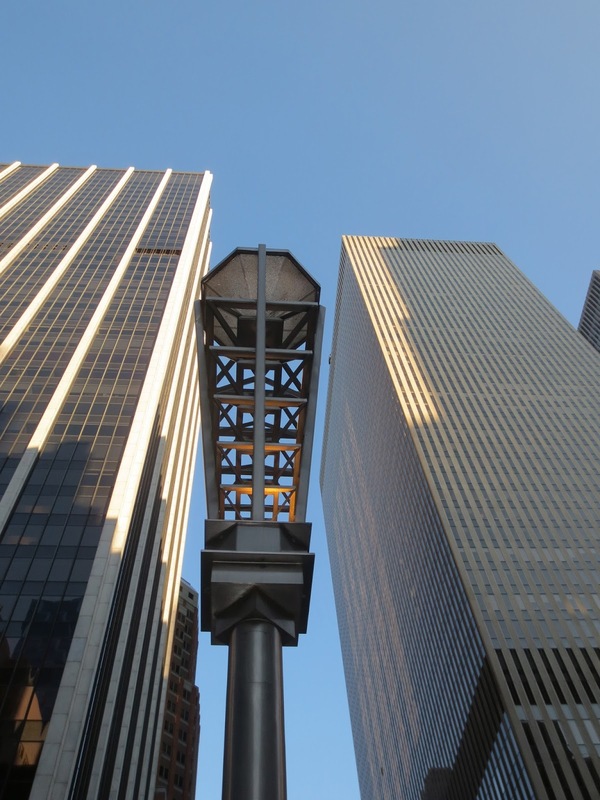 This block brings in $24 billion a year to New York. The district employs 22,300 workers, and another 10,000 if you include indirect employees. 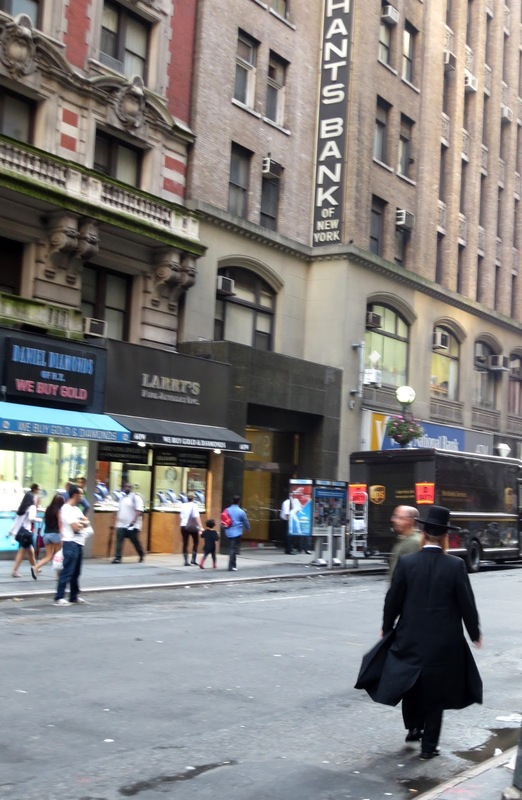 About 95% of the traders and workers are Jewish and many are Hasidim. During the Spanish Inquisition of 1492 the Jewish diamond merchants had to leave Spain and set up shops in Amsterdam. Because diamond cutting required very little equipment other than some hand tools, the Jews soon made Amsterdam the diamond capitol of Europe. During WWII the Jews that escaped fled to the United States. There is a small Radio City Synagogue on the third floor of 30 W. 47th St. 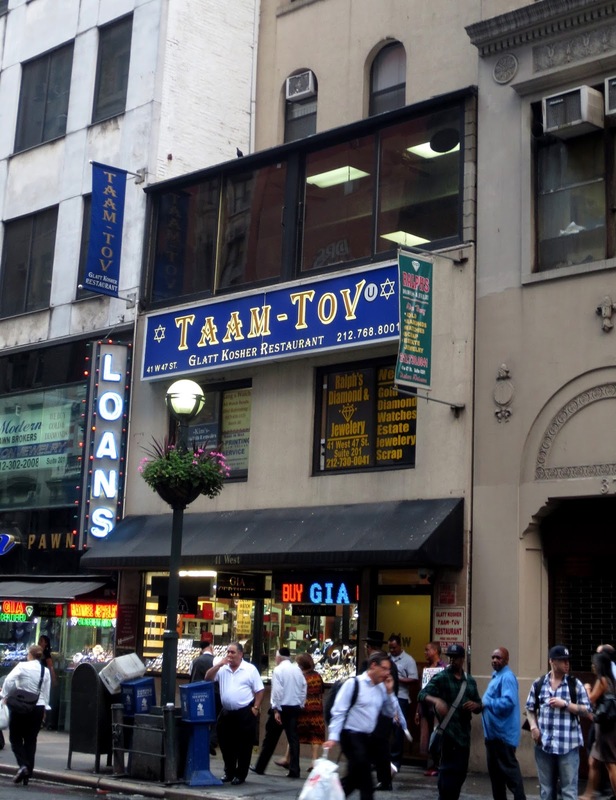 There is Manhattan’s only Bukharan kosher eatery, Taam-Tov in N41 where you can have Shish kebabs and pilafs. 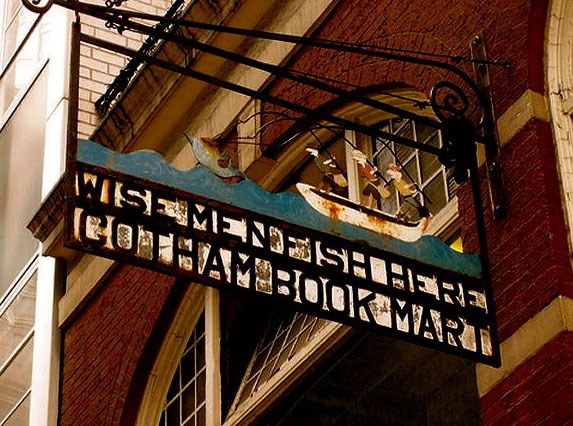 For 58 years, 41 W. 47th St. was home to the Gotham Book Mart (the name was inspired by Washington Irving). The store specialized in poetry, literature, books about theater, art, music and dance. The store virtually played as a literary salon, hosting poetry and author readings and art exhibits. 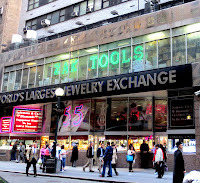 American writer Arthur Miller said about the store: “ It's impossible to imagine New York City without it." Fanny Steloff, the owner of the store that was open in 1920, died in 1989 when she was 101. The house was purchased in 1946 for $65,000 and sold in 2003 for $7.2 million to Boris Aranov, who owned another adjacent building.